There are only a few dozen people currently studying with the International Academy of Kabbalah in Chinese, because many of our Chinese students reside in North America and study in English. 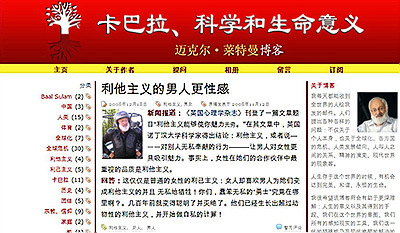 However, we hope that with the release of my new book in Chinese as well as this blog, we will find many new friends. News Report (from ABC News): …a bailout drama is playing out inside the closed-down Republic Windows & Doors factory in Chicago, where more than 200 angry workers have hunkered down after they were abruptly fired … without final pay or benefits. The union workers believe they are victims of a bungled bailout and that Bank of America, which received $25 billion in the federal rescue package, stands between them and their paychecks. My Comment: The tensions that have erupted in Greece show us that the world is balancing on the brink of an explosion. People’s discontent is ready to erupt at the slightest cause, and it’s always easy to find an instigator of tension, even war. It is necessary for us to stop and think about the fact that it is impossible to curb our egoism using the conventional measures. The explosion may happen anywhere and at any moment. News Report (translated from utro.ru): The financial crisis has brought about a recession in tourism and dining, transportation and financial services industries. However, communication via mobile connections is the last thing people are willing to cut back on. News Report (translated from utro.ru): The legal sector of Russia’s alcohol market faces a catastrophic shortage of raw materials. By the beginning of next year, two thirds of all the alcohol factories in the country may have to cease operation. My Comment: This is a serious threat to the nation’s health. In fact, it may bring it to the brink of extinction. Conclusion: The crisis will influence us and people will feel it in every aspect of their lives. It will be felt differently in different parts of the world, but no one will be able to escape. In the end it will force us to create good connections with each other. We can do this now or after a period of exacerbation and wars. If mankind will accept that the things taking place are the Creator’s request for us to correct ourselves and ascend, then the crisis will turn into a joyful revelation of a perfect world. Laitman.com Post: What’s the Surest Bet to Save Your Money In Time of Crisis? Laitman.com Post: Why Are People Turning More Pessimistic?